WILMINGTON - Charlotte promoter David F. Crockett and three Charlotte based professional wrestlers were among six persons injured Saturday evening when their plant crashed near Wilmington. Crockett, 29, of 732 E. Park Ave. was reported in good condition late Saturday might at New Hanover Memorial Hospital in Wilmington. Also in good condition were wrestler Richard Fliehr, 24, known professionally as Ric Flair, and George Burrell Woodin, 41, listed by the New Hanover County Sheriff’s Department as a promoter. Wrestlers Robert Bruggers, 31, and Johnny Valentine, 47, were reported by a hospital spokesman to be in serious condition. The Pilot of the plane, Joseph Michael Farkas, 28, was listed in critical condition and was undergoing surgery for head injuries at the hospital late Saturday night. The hospital spokesman said Farkas' identification bore addresses in Monroe, Charlotte, and Connecticut. Hospital officials refused to give details on the other men's injuries. The six men reportedly left Charlotte in the yellow and white Cessna 310 at 5:30 p.m. for the Saturday night wrestling matches at Wilmington's Legion Stadium. Who owned the plane and where it took off couldn’t be learned immediately. About 6:25 PM when the plane was a bout a mile west of the Wilmington Airport and was approaching a runway, Farkas radioed the control tower that the one of his engines had stopped, according to Deputy Sheriff E. D. Long. Cutting across treetops and snagging a wing on a utility pole, the plane crashed about a half a mile from the airport along a railroad embankment and near a state prison camp according to the sheriff’s and state highway patrol reports.Several of the crash victims were thrown from the plane, and one was pinned between seats inside according to a spokesman for Ogden Rescue Squad, which carried the men to the hospital. Crockett is an official of Jim Crockett Promotions, a Charlotte based enterprise that specializes in sports promotions. Valentine considered one of the top professional wrestlers in the country has wrestled in a number of foreign countries including Japan and Australia. Known as a lover of opera and fine cuisine, Valentine has been a professional wrestler for 25 years. Flair Is a flamboyant blonde wrestler who has been wrestling in the Charlotte area about 2½ years. He is a native of Minnesota and had been scheduled to meet Ken Patera in a wrestling match at Charlotte’s Park Center Monday night. Bruggers, also from Minnesota played with Miami Dolphins football team as a linebacker for several years around 1970. He began wrestling in Charlotte about two years ago. I was in Legion Stadium the night the plane crashed. I wish I could remember it all but I am not as young as I used to be. The original card was to have been a double main event: Tim Woods vs. Johnny Valentine (with Woods avenging his broken leg at the hands of Valentine) and Ric Flair vs. Wahoo McDaniel which was a feud just getting started. 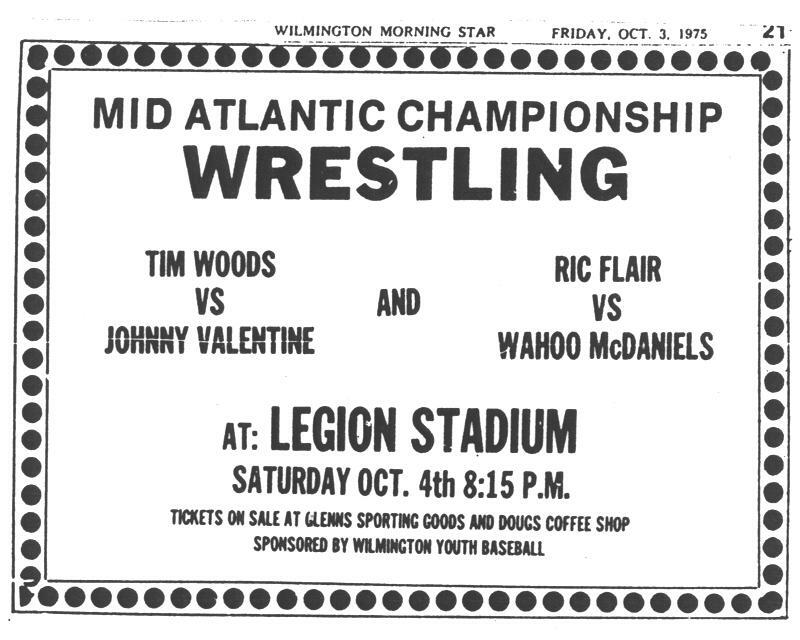 This was maybe my second or third live event, the one in Wilmington preceding this was Paul Jones vs. Valentine and on the under card of that was Flair vs. Ken Patera. That's how I remember both feuds were just getting started. The stadium was full and the ring announcer came out just after I had heard the rumor that there had been a crash. The show did not start late. The ring announcer was keeping kayfabe and said that there was a plane crash and Valentine and Flair were injured. He then went on to say that Tim Woods was lost and couldn't make it to the Stadium on time. Then he mentioned that the Spoiler # 1 was also lost. This has always puzzled me. Spoiler #2 and Spoiler #1 were a team that had come in to avenge the unmasking of The Super Destroyer. I honestly don't remember hearing that night that Bob Bruggers was on the plane or even scheduled to wrestle. Since Bruggers was injured and Spoiler # 1 disappeared from JCP about the same time I always theorized that Spoiler # 1 was Bob Bruggers. I recently had a chance to speak with Wahoo at a show and we talked about that night. He told me that Bob was his roommate when he was in the NFL and that Bruggers wasn't Spoiler # 1. Wahoo actually didn't seem to remember much about either Spoiler so he may have forgotten the angle after all these years but he was frank with me about the rest of his actions that night so I know he wasn't lying to me. Back to that night. Needless to say the crowd was in shock. Shortly after the initial announcement, Wahoo came out and said that they were still going to wrestle and ran down the revised card. I remember Danny Miller in the opening bout, he later teamed with Wahoo, Spoiler # 2 was the main heel on the card. I want to say that Abe Jacobs and Two Ton Harris were there but I can't remember for sure. I know Miller, Wahoo, and Spoiler #2 pulled double duty and maybe a few more. The finale would be a Battle Royal. After Wahoo ran down the card, he said that if we wanted to, we could get our money back and leave. I don't think anyone left. Wahoo won the Battle Royal that night and then went on to feud with Spoiler # 2 eventually unmasking him in several house shows, Wilmington and Richmond being two of them that I know of right off the top of my head. Wahoo told me he was supposed to take that plane also but changed his plans at the last minute and drove from Richmond I believe. He said he arrived in Wilmington, heard about the crash, and got to the crash sight as they were putting the guys in ambulances. The pilot was pretty messed up and later died after hanging on for maybe 2 months. Everyone else looked fine except for a few cuts and scratches because they had been throw from the plane according to Wahoo. There are some inconsistencies between what Wahoo said and the press reports. Some accounts have Valentine pinned in the plane and Wahoo’s account has him being thrown from the plane . It could be that he was removed before Wahoo got to the scene of the crash. 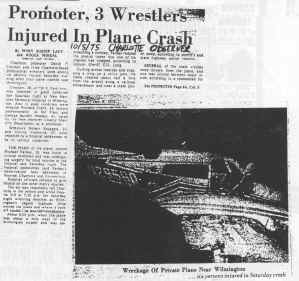 There was an article that ran in The Wilmington Morning Star the day after the crash. I remember that there was a picture of the plane and I spent what seemed like hours pouring over it. I remember trying to convince myself that part of the wreckage was the U.S. Title. I'll try to dig up the article from the library. I wanted to let you know the good news and thank you for opening a door for me by publishing my article about the Wilmington plane crash. in 1975. I was contacted by Kevin Kelly with the WWE. He is researching the crash and found my article on your site. They plan on doing a piece on the crash for an upcoming "WWE Confidential" segment. They have asked me to appear at the Raw show in North Charleston Monday and I will be taping an on camera interview. They said they are going to also try to speak with Tim Woods and David Crockett when they are in Dallas the following week.